Surrey's former England one-day international batsman Vikram Solanki has announnced his retirement from first-class cricket at the age of 39. The ex-Worcestershire skipper, who spent 17 years at New Road until 2012 when he joined Surrey, played 51 ODIs. 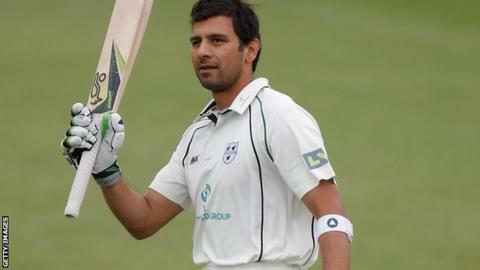 Solanki hit 18,359 first-class runs, his 34 tons including a career-best 270 against Gloucestershire in 2008. He also played in three Twenty20 internationals for his country, two of which were at the 2007 World T20. He also twice hit tons for England among his 16 limited-overs centuries. Solanki played the majority of his 325 first-class games for Worcestershire (15,100 runs in 268 matches at an average of 35.36) before making 1,616 runs in 28 games for Surrey at 36.72. He played five times in India for Rajasthan (2006-07), 21 times for England A, represented England Lions, an England XI and the Rest of England but never won a full England Test cap. "Whilst the realisation that my playing days are coming to an end is naturally difficult to come to terms with, the decision to retire is one that I have had some time to think about," he said. "I have been very fortunate to have played for two wonderful clubs, as well as for England, and would like to thank everyone that has played a part in my career for their help and support over the years." After leaving Worcester at the end of the 2012 season, Solanki spent his final three seasons with Surrey, playing alongside his former New Road team-mates Gareth Batty and Steven Davies. But the Wolverhampton-born player has made just one Championship appearance in 2015, once in the One-Day Cup and five times in the T20. "I would like to congratulate him on an outstanding career," said Surrey director of cricket Alec Stewart. "He has set very high standards throughout his time in the game, is a model professional and should be immensely proud of everything he has achieved."